It was Turnaround Tuesday for some indices and currencies today. However the picture was not uniform. European indices recovered as Italian bond yields pulled back, as did NKY. However the mood was not shared in the US, with SPX and DJIA down slightly, but once again NDX advanced. DXY gave up the previous day’s gains to close 0.11% down, with EUR and GBP (and Gold) slightly up following the Draghi comments and further positive Brexit news out of Berlin. A slight pullback in Oil prevented CAD from moving, and Asian currencies AUD and JPY were slightly down. Yields added 1bp. As predicted, the Fed raised rates today to 2.25%, a ten-year high. The effect is usually seen immediately in equities, whereas currencies are sometimes slower to react, and so it was today. Some of this effect is because a lot of currency trading is done outside the US, which is closed and the time of the release. Equities were down following the rate announcement, with only NKY (because of timing) and NDX (because of strength) remaining flat. After sliding earlier, DXY rose a modest 0.12%, with a clear demarcation. CAD, GBP and EUR were down, but Asian currencies AUD, NZD and JPY were up. Again timing may come into this. Oil and Gold were slightly down in line with the rate-hike driven dollar strength. With US 10-year bond yields, it was a case of buy the rumor, sell the news. They fell by 4.5bp, the largest drop in a month. 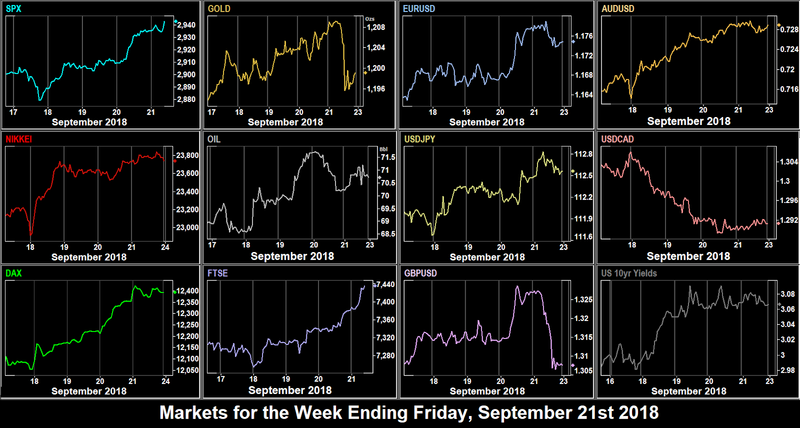 Thursday was heavy on news releases, after beats on the key German inflation at 12:00 (and earlier confidence indicator beats), and US GDP and PCE at 12:30, all markets rose, with again NDX as the leader, with AAPL up 2.6%. NKY made a new 27-year all-time high. However, the Italian MIB fell 0.6% after a high public spending budget was passed by the new populist parliament. 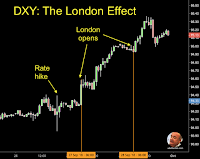 In forex, the effect of the rate rise was seen as soon as London (the world forex centre) opened. 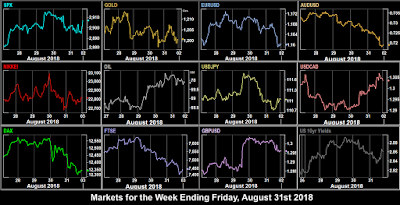 The dollar continued to rise all day, adding 0.78%, its best day since Jun 14 this year (the day after the last rate hike), and all currencies and Gold retreated heavily. Yields however, were surprisingly flat on the day. 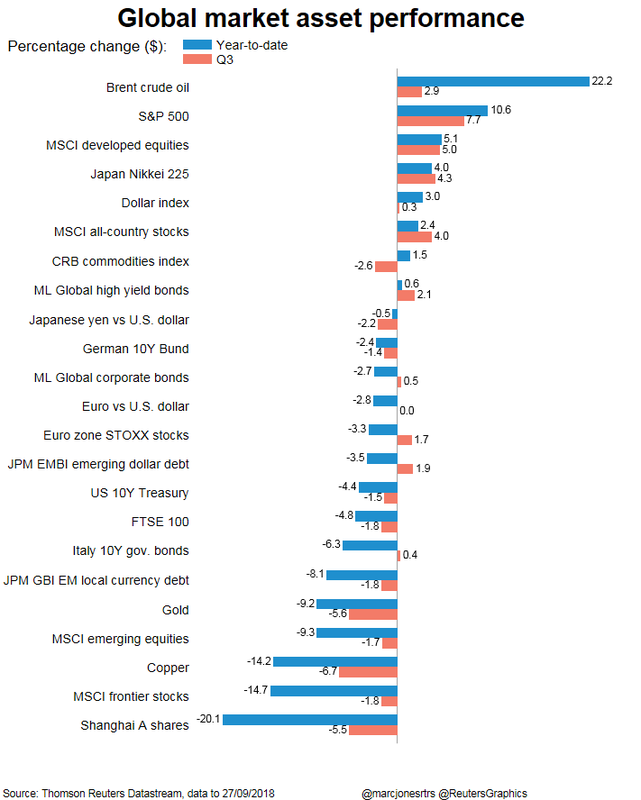 The end of month and quarter saw volatility as we predicted last week, however the key driver was not portfolio balancing but a collapse in sentiment in Italy following the populist budget, as the MIB fell 3.6% and Italian 10-year yields shooting up at one point by 40bp to a five-year high, to close 25bp higher. This pushed DAX down 1.09% and added to yesterday’s EUR fall. FTSE was down in line, although SPX ended the day flat, and NKY even managed a small rise on a weaker yen. NDX managed a small gain despite a 12% fall in TSLA, following promised regulatory action over Elon Musk’s infamous ‘funding secured’ tweet, and a 2.3% drop in FB after an admission of hacked accounts. SPX closed the quarter up 7.3%, its best Q2 since 2013. DXY managed a small advance of 0.12%, but this covered a mixed picture in markets. GBP was down after the GDP miss, as was EUR after the Eurozone CPI miss and the Italian situation. However, this was balanced by a sharp rise in CAD (+1.03%) following a strong rally in Oil (+1.83%), and the Canadian GDP beat at 12:30. This was despite the fact that the Canada NAFTA deal is still not finalised (deadline:this Sunday). AUD and NZD were also up, as was Gold. Yields added 1bp, to close the first week for seven years entirely above 3%. USD gave its best performance in seven weeks, with DXY up 0.96%. Only CAD performed slightly better, and after last week’s strong performance, NZD was the biggest slider. Selling NZDCAD was therefore the best forex trade. Indices were all over the place (contrast the huge NKY/NIFTY difference), but the Italian bond collapse on Friday made shorting DAX the best index trade. The FAANGs surged ahead—except for scandal-hit FB, with AMZN the overall leader, adding 4.59% against a general NDX gain of only 2%. One swallow does not make a summer, and after their brief respite last week, cryptos fell again, with, as before, ETH fading harder than BTC. 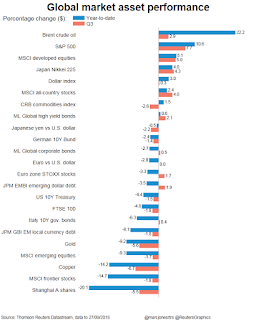 The new week and month also starts Q4, arguably the busiest quarter of the year, with the mid-term elections, Black Friday, the Santa rally, and of course a new earnings season. Like 2017, there was little sign of Q3 summer risk-off fatigue in the US, although the story was different in the rest of the world as this graphic from Reuters shows. Today is the first day of the China National Day Golden Week. Chinese markets are closed all week. It is Labour Day in some states in Australia but not Victoria, where the Melbourne stock exchange is situated. The British Conservative (ruling) Party annual conference starts on the Sunday, and Brexit is sure to be the main theme. Expect GBP volatility until the conference finishes on Wednesday. The Canadian NAFTA deadline was this weekend, and so may affect markets Monday. Chinese personal tax cuts come into force today. Fed speakers today are Bostic (2018 only voter, centrist), and Rosengren (2019 voter, hawkish). The day opens with the Australian rate decision. A hold at 1.5% is expected, but the recent Aussie jobs reports (44k vs 25k est) may give the RBA reason to be hawkish. Despite two weeks of recovery, AUD is still 11.22% off its January high. The official Mexico NAFTA deal is due to be published by the USTR. FRB vice-chair Quarles (centrist, voter in 2018 and 2019) speaks at 14:00, followed more importantly by Chair Powell. The Paris Auto Show starts today, but without the VW brand. Three Fed speakers today, Evans (dovish, 2019 voter) at 10:30, Barkin (hawkish, 2018-only voter) and Mester (hawk, 2018-only voter). There is the ADP print, a ’sneak preview’ for NFP, with an estimate of 185k, very similar to the NFP estimate for Friday. Otherwise most of the day’s releases are PMIs. There are rate decisions today in Poland and Romania, both are expected to hold. Turkish inflation is also published. A quieter day today, with only the weekly Jobless Claims and Factory Orders releases from the US. Fed Quarles speaks again, and there is a rate decision in Mexico, hold expected. NFP day again, and this is concurrent with Canada, so expect big moves in USDCAD. The US Average Hourly Earnings report is expected to improve from 2.9% to 3%, and unemployment is expected to fall from 3.9% to 3.8%. Canada’s unemployment is also expected to improve by 0.1%. There is a rate decision in India. A 25bp increase is possible, but by no means certain. INR is down 12.8% this year, and showing no signs of bottoming. A ruling is expected today from the ECJ on whether the ECB QE program falls within the bank’s mandate, after a challenge from Germany that it constitutes state aid. Although non-binding, the decision could affect EUR. Trade war concerns started the week on a pessimistic note and all equity markets were down. Tech stocks were hit particularly hard, on fears, not previously expressed, that protectionist policies could hit the sector. NDX fell 1.4% against SPX’s 0.6%. The dollar had a bad day, with DXY giving up 0.45%, all currencies gained except CAD which was slightly down in line with the 0.5% fade in Oil. Gold was up in line with the weaker dollar and risk off. US 10-year yields briefly broke the 3% barrier again, before settling flat at 2.99%. The only news of the day, Eurozone CPI which was in line with estimates had no effect, as we said last week. Turnaround Tuesday today for equities and Oil, which rose in line, as did bond yields, back over 3% as money rotated from bonds to stocks. This was the day that China retaliated on trade tariffs, but the market had clearly priced that in, although the markets did not recover all of Monday’s pullback. Also the The USD picture was mixed, with DXY flat on the day. 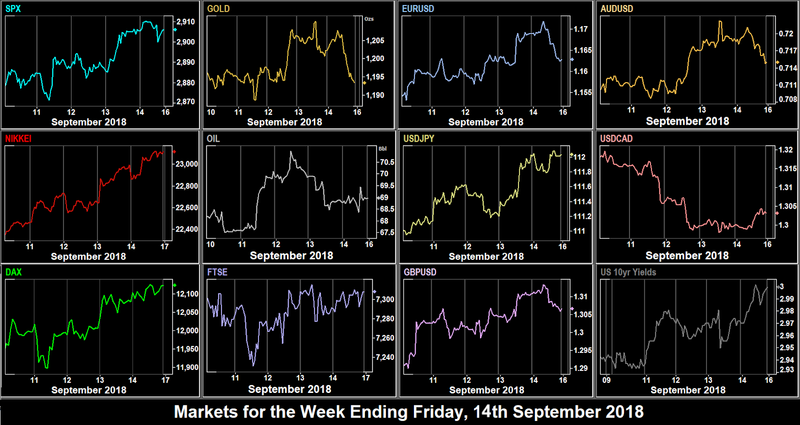 However, this masked some movement where commodity currency CAD (and AUD and NZD not part of DXY) were up, and JPY and Gold were down, all in line with the risk-on sentiment, as were Brexit-troubled EUR and GBP were down Yields were up sharply by 5bp, to 3.05%, in line with the equities move. Stocks were still positive today, although the rally flattened out, as positive news about Chinese economy plans came from the World Economic Forum in Tianjin, China. Oil rallied on the China news. 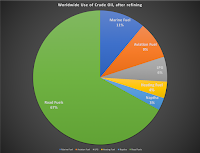 Chinese goods require a lot more oil to transport them that US goods. The higher the technology, the higher the value/weight ratio, and vice versa. There is a lot more transportation (ie Oil) cost in the price of a piece of garden furniture than that of a mobile phone. NKY pulled back a little on a rare positive day for the yen. NDX slipped slightly driven by MSFT dividend dissatisfaction. DAX and FTSE outperformed the US. Although the EU and China also have free trade issues, it seems that sometimes my enemy’s enemy is my friend. 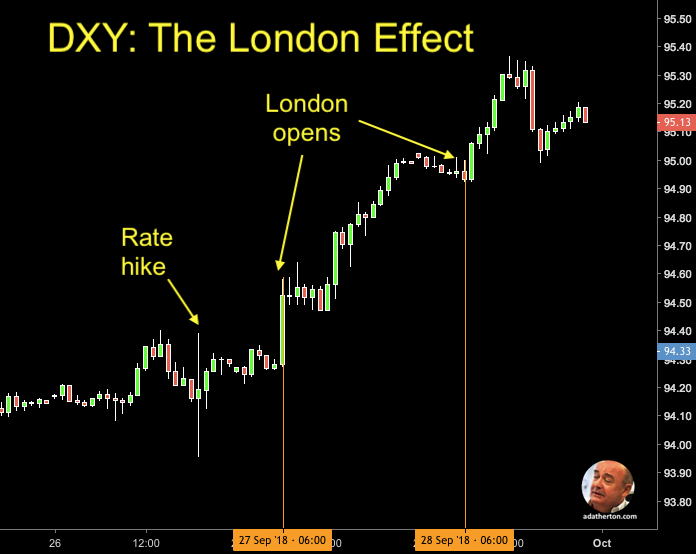 There was little forex volatility today. A slight advance in EUR was balanced by a JPY retreat, and despite a 117 pip range, rallying on the inflation print beat at 08:30, then pulling back on bad Brexit news, GBP closed only 2 pips down. Also AUD was strong, up 0.61%, following the Chinese news and the third green day for Gold. Following the positive WEF sentiment of Wednesday, with optimism for Chinese growth, and the Philly Fed Manufacturing survey beat at 12:30, SPX and DJIA resumed their strong rally, and both hit all-time highs. Non-US indices also showed strong advances. Oil however gave up some of the previous day’s gains. The dollar carried on downwards (DXY -0.69%) with a particularly strong showing from EUR, and GBP after the retail sales beat at 08:30. Even a warning from Austria than UK PM May’s Brexit plan “would not work” only caused a temporary small pullback. NZD advanced 1.07%, its best day since Feb 14 this year. All currencies (even JPY) were up, as was Gold. Notably EUR was up 0.8% against NOK after the Norwegian rate decision. Bond yields were down in line with the weaker dollar, but only by 1bp. The dollar was up anyway, against all other currencies, although the move in other currencies was less pronounced (EUR was only down 0.26%, resulting in an overall advance in DXY of 0.34%). Canadian CPI came in at 12:30 in line with the estimated, and the loonie hardly moved. Gold was down in line, at one point (like GBP) giving up all the week’s gains, but then recovering slightly to close down 0.62%, a fourth weekly close under $1,200. Yields were also up in line, with the 10-year note registering its first ever weekly close above 3%. The dollar fade continued in earnest this week, with DXY down 0.75%. It would have been more except for the sharp GBP pullback on Friday. Only JPY retreated, so the best buy of the week was NZDJPY, which ironically was the best sell two weeks ago. Foreign indices outperformed the US this week, with NKY winning for a second week, helped by JPY weakness. Cryptos finally had a good week, whereas the FAANG stocks were slightly negative for once. US and Chinese retaliatory trade tariffs come into effect today. The next spat, which may happen this week is the USTR view on the remaining $267Bn of Chinese imports. The UK Labour Party (opposition) Annual Conference runs Sunday thru Wednesday. There was an OPEC meeting in Algeria on Sunday. News is light, with only the Chicago Fed report from the US. There are market holidays in Australia, China and Japan, so expect a very quiet Asian session. It is possible that the US and Canada will reach an agreement today on NAFTA, prior to the Sep 30 deadline. At some point this week, President Trump is expected to discuss Iran sanctions. There is a rate decision in Nigeria. Another light economic news day. Today is the Fed interest rate decision, and over the weekend, CME Fedwatch rated the chance of a hike to 2.25% at 93.8%, actually a little lower than their usual predictions, so close to the event. The projections (dot-plot) are less certain and therefore more closely studied. There are public hearings today on Turkish tariffs, following the combative President Erdogan’s prompt retaliation to the doubling of the steel/aluminum tariffs a few weeks ago. Of less importance is the NZ rate decision late in the day. A packed calendar of releases includes inflation from Germany, Eurozone and Japan (Tokyo), as well as inflation proxy PCE in the US. The most important print, however, is the US GDP at 12:30. New public finance targets are expected from Italy. There are rate decisions in EM countries Indonesia, Phillippines and Egypt. The final trading day of the week, month and quarter should see some portfolio rebalancing volatility, often meaning that weak stocks are sold and strong stocks are bought. This benefits DJIA most of all, which is price weighted. We saw some of this last week, when DJIA outperformed SPX. The US PCE YoY and MoM figures are important, but of course the QoQ figure has been released the day before. There is a rate decision in Colombia. After posting red candles every day last week, SPX recovered (as shown on our chart last week) and managed a modest 0.2% gain. DAX and NKY were more firmly up, as Italian stocks and bonds recovered, with the MIB adding 2.30%, its best day since April 2017, after comments about prudence from the Italian economy minister. Only FTSE was red, reflecting a fall in Oil and a strong (0.79%) rally in GBP following positive comments from EU negotiator Barnier, and the UK GDP (0.3% vs 0.2%) and Trade Balance beats at 08:30. EM currencies TRY, ARS and RUB fell again, but the overall picture for USD was weak with DXY giving up 0.29%. All currencies rose, except JPY which pulled back on the risk on mood. Gold was flat, and US 10-year yields fell 1.5bp in line with the fading dollar. The Swedish election result had little effect on either SEK or EUR. 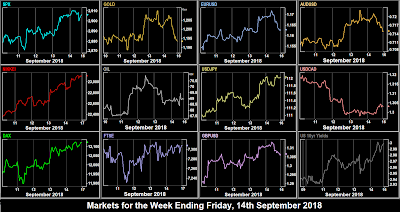 After a shaky start both in Europe and in the US, indices recovered, leaving SPX slightly up, and DAX and FTSE, which close earlier, slightly down. NKY NKY did better, reacting to the falling yen, as you can see from our main chart, the week’s price action for NKY and USDJPY is very similar. Generally positive news, such as the JOLTS jobs beat at 15:00 was tempered with tariff concerns. 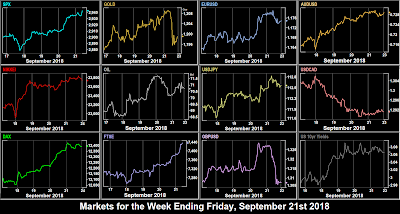 The big story of the day was Oil, which added 3.54%, its best day since June on a combination of Hurricane Florence concerns, sanctions on Iran, forecasts for lower US shale production, and a stellar beat on the API stock level (-8.64M vs -1.20M last week). We sometime have to search for reasons [for price moves], and sometimes we have too many of them! It was a flat day for DXY, with EUR and GBP relatively quiet (despite the jobs and average earnings beats in the UK at 08:30), and the small fall in JPY (13.6% of DXY) being balanced by a slightly large move up in CAD (9.1%), probably following the Oil price, as the only Canadian data of the day, Housing Starts at 12:15 missed. Gold was also flat. It was therefore surprising to see yields rise 4bp on the ten and two year notes. This was probably due to a $35Bn 3-year auction which raised 2.821%, the highest since May 2007. Italian and German 10-year yields were also up substantially. Today was fairly flat day for indices, with SPX and NDX moving down very slightly. NKY was also flat. DAX and FTSE posted modest gains, although the former lost these in post-market futures. FTSE held on to finish green, as Oil continued to rise, pushing through the psychological $70 mark after the EIA beat at 14:30, and BNO touching $80 for the first time since May. It was another down day for USD, and this time JPY came into line, so all currencies were up against the greenback. Gold had its best day this month adding nearly $8 (0.65%) and yields fell 1.5bp, both in line with the across-the-board dollar move, not helped by the Core PPI (CPI proxy) miss at 12:30. AUD was particularly strong, in line with the Gold rally, proving again the strong intermarket link between these two instruments. Today was the best day for stocks this week, as China welcomed an invitation to hold fresh trade talks, which traders interpreted that the $200Bn package may be delayed. US markets rose substantially, with SPX adding 0.6%, its best day of the month. NKY had a similar rally, following a weaker yen, which did its usual risk-off thing. NKY/USDJPY divergence is often seen in the Asian cash market, but when the US market is open, the NKY futures contract is closely correlated with USDJPY. DAX and FTSE were more or less flat, after a clear rally in EUR and GBP. Overall, the currency situation was very much like Monday. DXY pulled back 0.28% after the important CPI print at 13:30 missed (Core 2.2% vs 2.4%). Interestingly, the normally important BoE and ECB rate decisions (11:00 and 11:45, hold, as expected, in both) made little difference to GBP and EUR, their sharp upward moves came later on the CPI print. Similarly, AUD also reacted much more strongly to US CPI that its own jobs report beat at 01:30. JPY rallied very slightly at that time, but quickly assumed its risk on fade, and ended up down 0.6% on the day at a two-week low. Gold faded with equity risk-on, rather than follow the dollar. Oil pulled back, giving up some of the previous two days gains. The Turkish central bank raised rates by 6.25% to 24%, and TRY rallied 4.22% on the news, although still lower than the price two weeks before. Although retail sales missed at 12:30, the previous month was revised upwards, and the Michigan Consumer Sentiment Index beat, and broke through 100, the original 1966 base. This was enough for another equity rally, particularly with NKY which reached to a new seven month high. US and European indices also rallied, but pulled back (after the European close) when President Trump confirmed the $200Bn China tariffs at 16:00. SPX promptly dropped 12 handles and DJIA 143 points. Some of this was recovered later in the session, and added to the earlier gains, SPX, DAX and FTSE all closed green. Following Turkey, Russia raised rates today, and RUB added 0.48%. With the lighter EM mood and positive stock sentiment, DXY was up 0.42%, and rose across the board, with all currencies and Gold retreating. Yields rose in line, and briefly broke the 3% psychological barrier, to settle at 2.998%, up 3bp on the day. Oil was flat on the day. 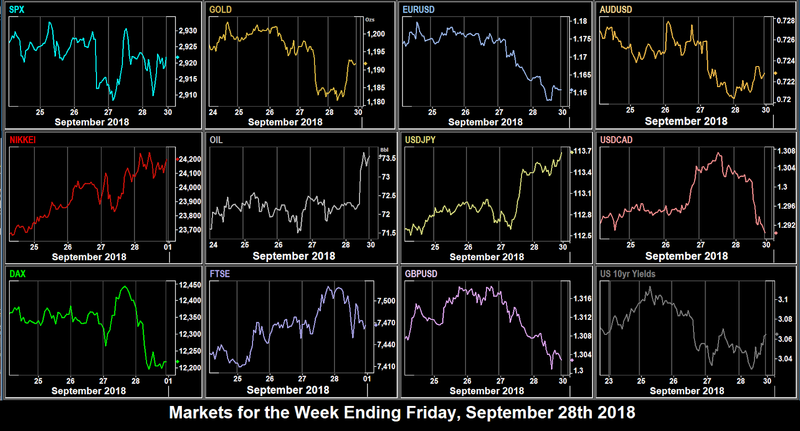 A downturn for DXY this week (-0.41%), and a reversal of last week’s situation with an increase in all currencies except yen, and indices up. The good news for sterling made buying GBPJPY this week’s best trade. The outstanding index was NKY, which had its best week since March and was this week’s best index trade. Cryptos were unusually stable this week, with BTC in its narrowest range (6.19%) since the crash in January. ETH touched its lowest price in over a year. In FAANGs, NFLX outperformed against a fairly flat performance from the others. US-Canada trade talks resume today, with Thursday being a deadline for the final report on Sep 30. The $200Bn China tariffs confirmed on Friday could start at any time. The NY Empire State manufacturing index print is at 12:30, but the only important news of the day is Eurozone CPI, and even this is usually a non-event, as the constituent countries have already reported. No important US releases today. The minor Redbook Index (a proxy for Retail Sales, which was released last week and is itself a proxy for CPI) is released at 13:55. In the EM arena, there are new polls out for the presidential race in Brazil, and a rate decision on HUF from the MNB (Magyar Nemzeti Bank, Hungary’s CB). HUF is down 7.89% against USD so far this year, although it is off its lows. Hungarian CPI is also released today. There is a small possibility of some trade dialogue between China and the US at UN meetings held today. North and South Korea start a two day summit. ECB President Draghi speaks at 07:15. The RBA minutes are unlikely to surprise. Today is this week’s big day for news. In EMs we have South African CPI at 08:00, the Brazilian rate decision at 17:00, and Argentina GDP at 19:00. The reason we watch these during the current EM crisis is contagion theory. Very bad news from any EM country can precipitate severe moves, which in turn can be reflected in other EM currencies. If the contaminated currency then has further bad news and, say, breaks a key support level, a chain reaction can occur. In mainstream markets, again the US is quiet. The key news of the day is UK CPI, although this is muted as the UK rate decision was last week. BoE Chief Economist Haldane speaks in Estonia at 08:00. The Japanese LDP (ruling party) leadership election (by members of parliament) is held today. It is likely that Shinzo Abe will retain the job, but if he didn’t, look out for volatility in JPY and NKY. Three rate decisions today in Switzerland (07:30), Norway (08:00) and most importantly South Africa (13:00). ZAR is down 29.4% from the 11.50 high at the beginning of March. It is also the practical deadline for Mexico to agree NAFTA terms (like Monday was for Canada). ECB Praet speaks at 17:20. 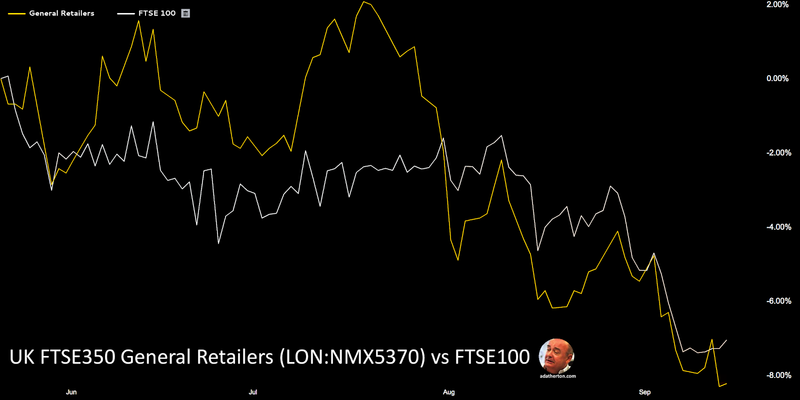 UK Retail Sales will be watched closely, given recent dire reports from Debenhams (LON:DEB) and John Lewis (private). 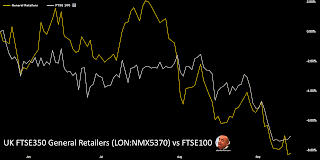 The FTSE 350 General Retailer index has been falling heavily since mid-July. There’s nothing on the calendar today other than the releases., which are mostly Markit PMIs. Canadian CPI and Retail Sales (the same thing) may provide some CAD volatility. Of course for the previous two Fridays, President Trump has hit the markets with tariff announcements. If he does so today, it is more likely to be about NAFTA than China. Apple’s new iPhones are released in-store, cue lines outside shops … or not. Monday was Labor Day and US markets were closed, and SPX futures were slightly down. Foreign markets were mixed, with NKY falling slightly (after a 200 point rally in the Asian session faded) DAX was also flat, and only FTSE showing a noticeable increase which was entirely down to a sharp fall in GBP which gapped down after negative remarks from EU Chief Brexit Negotiator Barnier over the weekend, and finished the day 0.63% lower. The British index posted its only green candle of the week. The other currency to fall was CAD, after President Trump attacked the Canada NAFTA deal at the weekend, and threatened to pull out. EUR took up the slack to end DXY flat and AUD showed modest gains, with JPY and Gold flat. Oil was also quiet, adding 0.4%. Bonds were not traded due to the holiday. The equity downward trend continued today, as trade wars continued to weigh on sentiment, which made AMZN’s 0.64% gain to cross the line and join AAPL as a $1 trillion ($1,000 billion) dollar company all the more impressive. The company’s share price has doubled this year. All indices were down on the day. In forex, DXY had a good day adding 0.29% after the ISM Manufacturing PMI beat (14:00) which we highlighted last week as important. Gold fell sharply by $8 (0.7%) in line with the stronger dollar, as were yields, up 4bp. All currencies were down, particularly CAD after their Manufacturing PMI (13:30) missed. Oil spiked briefly to new six-week high of 71.37, but the retreated to end the day down. NZD didn’t react to the positive GDT Milk auction, and had already fallen nearly 1% in the Asian session. AUD spiked briefly on the rate decision (1.5% hold) at 04:30 but had given up all its gains by the time Governor Lowe spoke, during the European session at 09:30. Same problem, same result. 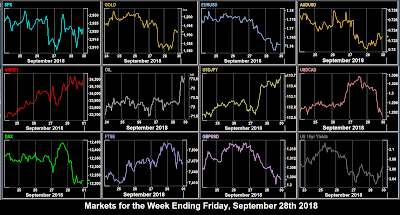 The trade wars, and the continued EM currency crisis continued to depress markets, despite one ray of hope, Italian bond yields, which had fallen sharply on Tuesday continued to retreat, settling below 3% for the first time since in two weeks. Equities were down across the board, with SPX giving up 0.3%., and a strong tech sell-off with NDX down 1.2%, although DJIA was flat. Oil continued to slide down in line with the markets, as it does when the concern is trade. We explained this a few weeks ago, obvious though it is. 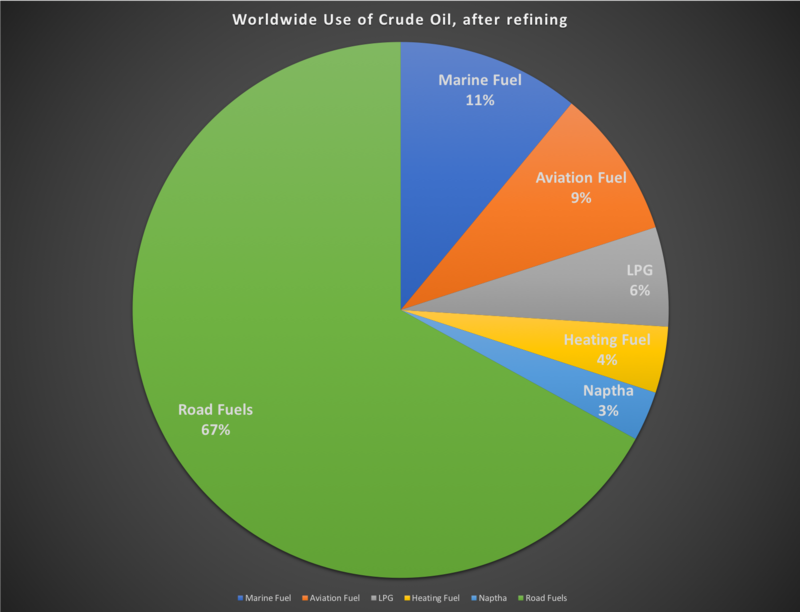 Most (see the chart) oil is used for transport fuel. Less trade, less transport, less demand for oil. The API beat after the close arrested the fall for a few hours only. There were more problems in the EM market today, as ZAR and INR made record lows, and IDR fell to a 20-year low, and this against a falling DXY which give up all of Tuesday’s gains. AUD spiked on the GDP beat at 01:30, but as yesterday, gave up that gain by the end of the Asian session, and ended down on the day. AUD is of course not part of DXY. CAD on the other hand is, but was surprisingly weak after the rate hold, adding only 0.1% despite hawkish BoC comments. Clearly NAFTA trumps Poloz if you’ll pardon the pun. The yen was flat as were US yields. The main reason for the DXY move was a huge spike up in both GBP and EUR following news that Germany and the UK had made progress on a Brexit deal. We are now in the final two quarters before exit, and these Brexit announcements are starting to make a difference. Note however that this spike only took GBP to close the weekend gap, after which it faded. No letup today, markets continued to fall. There was no specific trade war news and economic releases were mixed, the Markit PMIs at 13:45 missed but the ‘official’ ISM figure 15 minutes later was a beat. However, and more importantly the ADP jobs figure (NFP preview) figure at 13:15 missed (163k vs 190k estimate). Always remember that Fed policy is the principal driver of markets, and jobs and inflation are what the Fed use to determine policy (the ‘dual mandate’). Even GDP releases are secondary to this. This is why proxy prints like Retail Sales and PCE for CPI, or ADP for NFP have a strong influence. Traders were also concerned about the $200Bn China tariff package as the consultation period came to an end. So—SPX sold off sharply at the cash open, giving up 21 handles (0.74%) in the first hour and never really recovered. The speed of the drop drove VIX above 15, the first time for two weeks. Note also that September is historically the worst month for markets. 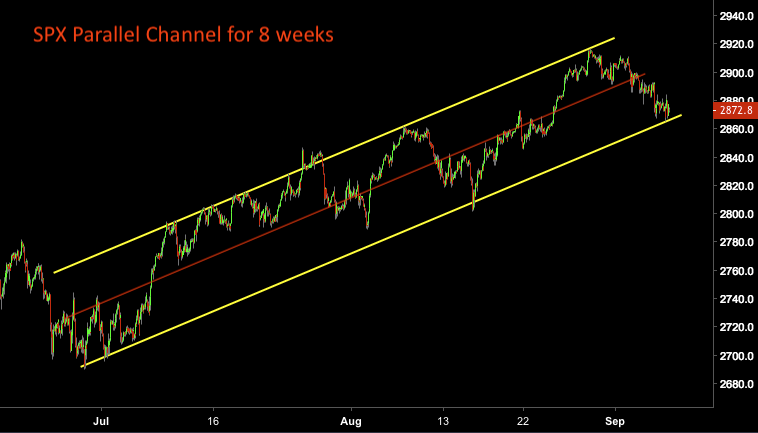 There may also be a technical component to this as SPX has been in a parallel channel for the last eight weeks, and hit the upper boundary as shown in our chart. 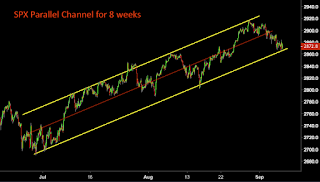 A centre line can be drawn in parallel channels and it is very common when this line breaks for the moves to be accelerated, as you can see in early July, early and mid-August from the chart. Needless to say, other indices followed suit, FTSE falling with Oil. 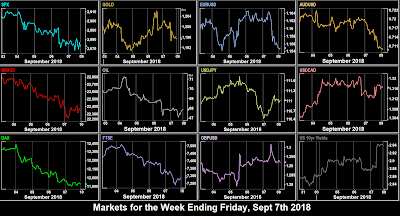 The master chart for the week shows FTSE and Oil moving almost identically. This was despite the EIA Stock beat at 14:30. The currency picture was much milder. The only serious mover was JPY, up a safe haven in line with the sharp equity drop, but moves up in GBP and CAD, and a flat Euro meant a nearly flat DXY (-0.08%). CAD and AUD were nearly flat and Gold only added $3. Yields were down 2bp as equity cash moved into fixed income. All other indices were also down, and all currencies (and Gold) gave up ground against the strong dollar. Oil was down in line with the indices. Canada missed on their NFP, posting a 51.6k contraction, and CAD duly fell 73 pips immediately, and ended the day 25 pips down. A creditable performance given the current NAFTA worries, although the loonie is down 2% in the last six working days. 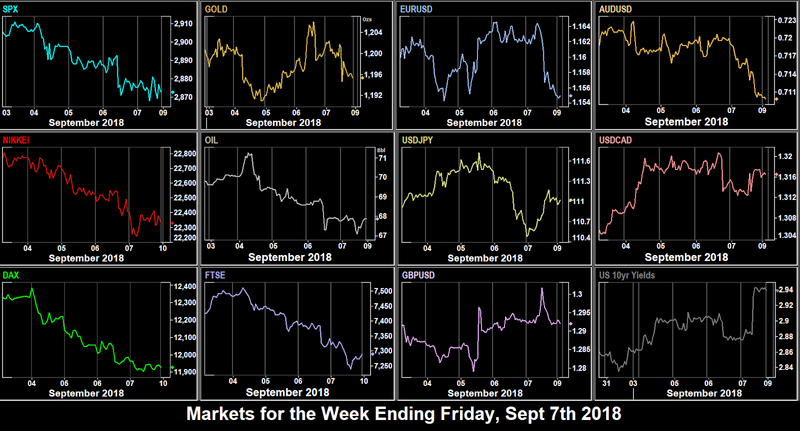 A second nearly flat week for DXY (up 0.16% after falling 0.08% last week), and also for the second week, NZD was the worst performer. The other currencies also fell except for a tiny increase in yen, which means shorting NZDJPY earned one pip more than NZDUSD. Indices were all down, with trade war sensitive DAX falling even further than Oil. The crypto carnage resumed after last weeks lull, with yet another double-digit loss for ETHBTC. After last week’s stellar rises, the FAANGs all faded as well, and all fell more than NDX which only lost 2.61%. FB was the biggest casualty. The USTR meet with the European Trade Commission today, following President Trump’s agreement to negotiate before increasing European car tariffs. This is a working group also looking at boosting US LNG exports and WTO reform. Public comments are due on US uranium imports. The most important economic release is UK GDP, given the rate decision on Thursday. Also we will have the results of the Swedish General Election, where the far-right are expected to make gains. This ominous anniversary has no US release of note, but another important GBP print, Average Earnings opens the European session. The German sentiment indicators may give direction to the beleagurued DAX index, currently 12.63% off its all-time high in January, and level with its Feb 6 bottom. US PPI today is a forward looking inflation indicator, and will set the scene for the actual CPI print tomorrow. As always, watch the API stock. Although the beat last week could not lift the Oil market, the print has been influential for most of the summer. Argentina have a Central Bank rate decision today, although no move from the world record 60% imposed last week is expected. Today is the AAPL product launch event (1700GMT). This is the most important day for the week for releases with both the BoE and ECB rate decisions. Expect considerable volatility in both currencies, and of course the important cross EURGBP. A hold is overwhelming expected in both cases, but as always, it is the press conference remarks that traders will be examining for direction. The ECB always hold the conference 45 minutes after the rate decision. To add to the volatility mix, the important US CPI release comes at the same time as ECB President Draghi speaks. There is also German CPI today, although this rarely affects markets, as the figure is usually in line with estimates. Earlier in the day is the Australian jobs report. The currency is languishing at two-and-a-half year lows, 12.75% off its 2018 high. The US Retail Sales print today is less important that usual as Retail Sales is a CPI proxy after the actual CPI itself. Or more interest is the University of Michigan sentiment index for indices, whereas currencies will probably be still feeling the effect of the BoE and ECB decisions the day before. Monday was a similar story to last week, the equities rally continued from Friday, on US-Mexico NAFTA deal expectations. The dollar decline also continued from Friday, with DXY fading 0.43% to 94.71, a four-week low, and all major currencies, and Gold up. Oil was up in line, and US 10-year yields were up. The FAANG stocks were up except for NFLX. The UK was closed for a public holiday. A mixed picture today on stocks, with SPX making further slight advances, as the trade deal was announced. MXN put on 1.7% on the news, even though the deal, as expected, is less favorable to Mexico than before. Nevertheless, it’s some kind of free trade deal from a protectionist White House, hence CAD also rallied, although the Canadian part of the deal has yet to be finalised. The yen and euro were slightly up, but GBP was slightly down, after its rally last week ran out of steam. Oil also rallied last week and Monday, and it was a similar story today. The net result was a flat DXY. Gold was down $10, but still remains $40 up from its Aug 16 low. Yields reacted for a second day to the risk-on mood, by rising 3bp (ie bond prices fell as money rotated from fixed income to equities). We said last week that Wednesday would be a big day, and at 12:30, GDP didn’t disappoint at 4.2% beating the estimate, and the highest print since Q3/2014. SPX, IXIC (the Nasdaq Composite, not the Tech 100), and RUT all set intraday and closing all-time highs. Tech stocks also rose, particularly AMZN adding 2.29% to close just shy of the psychological $2,000 barrier. DAX and NKY followed suit. Only FTSE posted a red candle due to GBP strength. The forex picture was mixed. The small DXY move (-0.20%) belied a 1.21% gain in GBP, after EU Brexit negotiator Barnier said he was close to offering the UK a deal. On the other hand, JPY fell sharply on the risk on mood, giving up 0.44%. AUD also fell, but EUR and CAD were slightly up. Gold recovered $5 in line with DXY, and yields were flat. Oil had its best day of the week, adding 1.68% on the EIA Stock beat at 14:30. The mood changed on Thursday after reports on fresh tariffs to be applied as soon as next week, which in turn faded hopes of a swift Canadian NAFTA deal. So we got the usual reaction we have been seeing these days, indices turning down (SPX -0.4%) and the dollar turning back up (DXY +0.18%). DAX and NKY fell particularly hard, the former on rising (up 7bp) Italian bond yields, and the latter on a reversal of yesterday’s JPY weakness, and late in futures on the tariff reports. Notwithstanding all this, AMZN ploughed ahead to make an all-time high of $2002.38. AAPL also made an ATH. The currency picture was uniformly dollar strength, except with JPY, which rose by 0.62%, recovering the previous day’s losses and then some. Gold was $6 down in line, and yields fell due to equity rotation back into bonds. Oil added another 0.9% to yesterday’s gains, making a close above $70 for the first time in August. 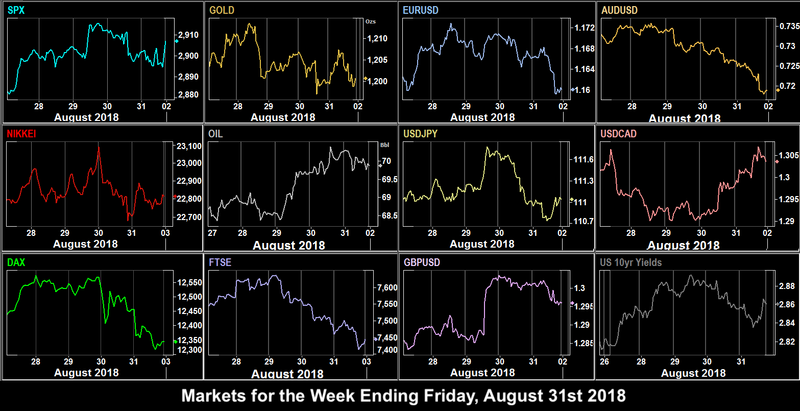 The end of the week and month, and the last day before the Labor Day holiday saw NKY advance in Asia, but then all indices fell during the European session on trade war sentiment, and Trump’s latest comments that he would withdraw from the WTO unless terms were changed. A recovery came late in the US session, probably due to end of month rotation allowed SPX to post a small (+0.11%) green candle. AMZN and AAPL made new ATHs again. The other indices had of course closed, and were finished red on the day. Another strong day for USD, with DXY (+0.42%) having its best day of the week, mainly because EUR gave up 0.6% losing all its gains for the week. The gains were consistent across all currencies, with even JPY giving a little ground. Gold was surprisingly flat as were bond yields. Oil slid back slightly to close at $69.87. DXY was virtually flat this week (down 0.08%), giving visibility to fundamentals in foreign countries. Australia appointed its seventh prime minister in 11 years on August 24th, adding to uncertainty, whereas the UK finally got something positive on Brexit. GBPAUD had its best week for nearly a year, adding 2.74% and was this week’s best forex trade. A direct consequence of the GBP rally was the fall in FTSE, this week’s worst performing index. Cryptos stabilised somewhat, but the gap between BTC and ETH widened for a fourth week. Last week, NFLX was the star FAANG performer, this week it was AMZN, with AAPL close behind. Today is Labor Day in the US and Canada, and although Asian and European markets are open as normal, there is no important economic news (and none from the US). Trade is therefore expected to be muted. Fed Evans (dovish, non-voter) speaks at 08:30, BoJ Governor Kuroda speaks at 05:40 and ECB Mersch is on at 18:30. The new Mexican government takes office. Back to work in North America. Labor Day traditionally marks the end of the summer vacation period, volumes normally increase, and risk on returns. The day kicks off with the RBA rate decision. A hold is expected, but the statement, and the Governor’s speech five hours later may give a clue to whether the RBA is happy with the current 20-month low (only 50 pips from a 29-month low, and down 11.65% in seven months), or will confirm that rate increases must be dependent on wage growth. The only US news is the ISM Manufacturing PMI, traditionally the most important PMI but increasingly less influential these days. Attention will therefore probably turn to trade wars and in Europe, the Italian bond yield. Fed Evans is on again today at 14:30. BoE Governor Carney testifies to the UK Parliament at 12:15. More Fed speakers today than we have seen for many months on a single day. All come towards the end of the day, with Williams (centrist, voter) at 19:00, Kashkari (dove, non-voter) at 20:00, Williams again at 20:15, and finally Bostic (hawkish, voter) at 22:30. We also have ECB Praet at 20:30. The most important news of the day is the BoC rate decision. Commentators are expecting (and markets have priced in) a hold this month, with a rate hike on October, after dovish comments from Governor Poloz at Jackson Hole. Another heavy CB speaker day, kicking off with BoJ member Kataoka 01:30, and then Fed Williams (centrist, voter) at 14:00, SNB Zurbrugg at 16:30 and BoC Wilkins at 18:30. There is a rate decision in Sweden (SEK is 4.2% of DXY), and we have the ADP jobs report (the NFP ‘preview’) and EIA Oil stock reports, both one day later this week due to Labor Day. The ADP estimate is identical to the NFP estimate at 187k. Note that the Oil report has moved the market in line with the result for the last few weeks, but the effect does not last long. It’s the first Friday of the month, so it’s NFP day for both the US and Canada. Check the estimates on the day—this was written five day before, and these do change. The Canadian estimate is very modesty at 3.3k, so there is some potential for USDCAD downside. The best USDCAD volatility is, of course, when one side of the 49th parallel misses and the other one beats. We have often mentioned before that CAD likes to more or less exactly reverse sharp previous moves, so if such a move occurs on the rate decision on Wednesday, you have a likely target. Whilst we are on the subject of USDCAD tactics, the pair is well-known for extending its move after the initial news spike, rather than quickly retracing as say, GBP, does. There’s another big list of Fed speakers today. We have Rosengren (hawk, non-voter) at 12:30, Mester (hawk, voter) at 13:30, Rosengren again at 14:45, and finally Kaplan (dove, non-voter) at 16:45. Today is also when the USTR is expected to announce a final decision on the $200Bn China tariffs. China publish their FX Reserves today. Next weekend is a general election in Sweden. It’s a similar story to other European elections, the rise of the anti-immigrant eurosceptics, in this case SD, the Sweden Democrats. They are currently polling third at 12.9% and could easily become part of the ruling coalition (most European countries have too many parties to elect an outright winner). This has strong implications for SEK, and by extension, some effect on EUR, and DXY. 06:00 EUR Germany Industrial Production/Trade Balance s.a.